No gas. No emissions. No power cord. 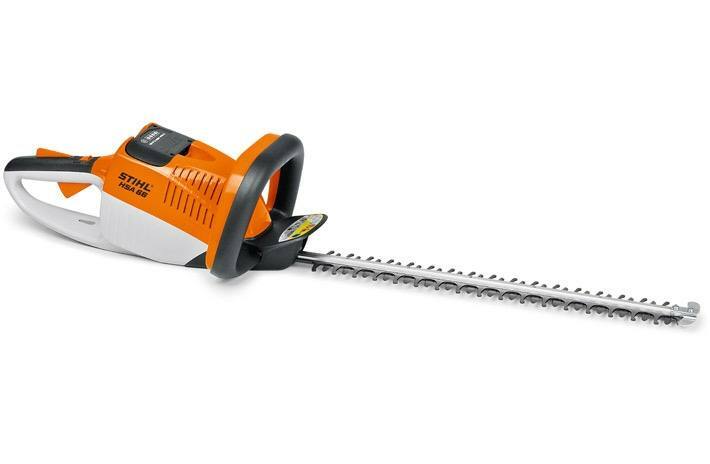 The HSA 66 hedge trimmer replaces the HSA 65 with reduced weight and an improved EC-motor. This unit is quiet, light, has increased cutting performance and maintains a constant stroke rate even during tough jobs. Mobile, light, powerful, low noise for use in residential and noise sensitive areas and long run times. Battery and charger sold separately. 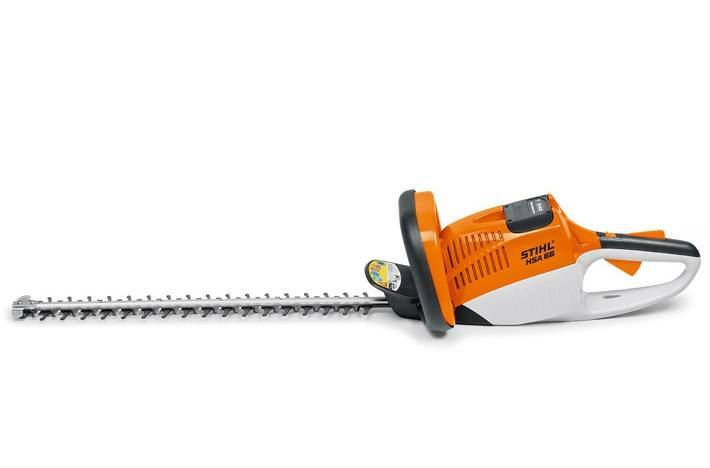 Double sided cutting blades: STIHL hedge trimmers with double-sided cutting blades cut both vertically and horizontally. Functional design: The engine housing has smooth surfaces and round contours. This prevents the tool from getting caught on branches. The hedge trimmers are easy to clean. Variable speed control and ergonomic loop handle: The ergonomic loop handle is ideal for working in any direction and ensures strength-saving work over longer periods. Two handed design: The tool is easily started by activating both switches on the loop handle and the rear handle at the same time. The cutting speed is continuously variable using the rear control, for a fine and precise cut. The two handed design is suitable for both left and right-handed users. Blade tip protector: The tip protector comes as standard and makes cutting near the ground or along walls easier while protecting the special cutters from damage. Blade cover: Protects the cutting blade for safe storage and transport. Hanging eye: The hedge trimmers can also be conveniently hung up on the wall with the practical hanging eye. 1) Approx. time running at continuous full power The version(s) available in each country may differ from the above range and specifications; specific details may be subject to change without notice. Please ask your local STIHL Approved Dealer for further information.